Volkswagen has released details on the new 2014 Golf GTD and reveals the new diesel GTD “Grand Turismo Diesel” will be even more fuel efficient than before. The newly designed Golf GTD will be more powerful, fuel-efficient and lower-emitting than ever before. Up until now the hot diesel hatch has only been available in Europe and not here in the U.S. Will we see the hot diesel here in North America? According to sources from Volkswagen who spoke with Edmunds at the Geneva Auto Show in March, Volkswagen is seriously considering bringing the new Golf GTD to the U.S. market. A Volkswagen source said, "Sales of our diesels have been rising in the U.S. and there's been a wide push internally to include more diesel variants of more models for buyers here. This is good news for U.S. buyers as the new hot diesel hatch will be not only fuel-efficient, but it will be powerful and fast. The VW source went on to say, “This time that might mean the GTD comes to the U.S., which would be critical to the image of diesels because this will be fast and will sound fantastic." Volkswagen has just released details on the new 2014 Golf GTD and it gets even more power than before. The new sporty 2014 Golf GTD will have 14 more PS, 30 Nm more torque, 0.9 l/100 km less fuel consumption and a 25 g/km improvement in CO2 emissions. The new model will be powered by a completely redesigned 2.0-liter turbocharged TDI engine that will produce 135 kW / 184 PS (182 hp), and up to 380 Nm torque (280 lb ft). That will make the new GTD one fast hatch with more neck-snapping amounts of torque. The maximum torque of 380 Nm is available at a constant range from 1,750 to 3,250 rpm. The new Golf GTD will be fast. The hot hatch will accelerate from 0-100 km/h in just 7.5 seconds. In fourth gear, Volkswagen says the diesel Golf will accelerate from 80-120 km/h in a safe 6.0 seconds. Its top speed of 230 km/h (142 mph) tells us that this will be a true sports car. It will also come with a sport suspension that has been lowered 15 mm and 17-inch Curitiba sport wheels and 225 performance tires. Volkswagen says it will put the new hot diesel hatch in the performance range of “high-class and high-priced” sports cars. To go along with the impressive performance, the new GTD will have even more impressive fuel-efficiency. Volkswagen says the diesel hatch with the new TDI and standard gearbox will consume just 4.2 liters of fuel per 100 km for the European cycle and CO2 emissions of just 109 g/km. That should translate to around 50 mpg here in the U.S. The new hot hatch will also feature a standard stop/start feature for the first time. Volkswagen will offer an optional automatic dual-clutch gearbox (DSG) that will get a low fuel consumption value of 4.5 l/100 km (CO2: 119 g/km). 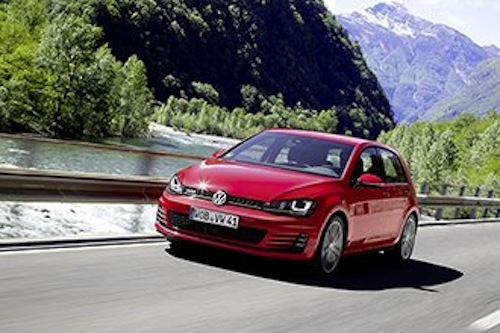 In both gearbox versions, the new Golf GTD conforms to the Euro-6 emissions standard that takes effect in 2014. The new 2014 Volkswagen Golf GTD will be available in Europe later this year and will likely launch here in the U.S. next year as a 2015 model. The U.S. model will be produced at the new plant recently announced for Golf production in Mexico. Pricing has not been announced, but the new diesel GTD will come at a premium price beyond the current TDI models which start at just over $24,000.